Sorry for the second-hand quality of the clip, but it was the best we could find. If we can get a better copy we’ll post it. 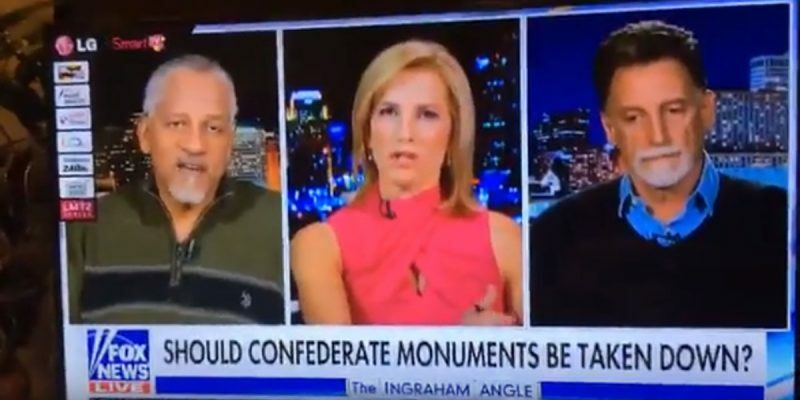 But last night Ingraham, who’s spending some time in Louisiana because she’s going to the Bacchus ball Sunday night after delivering the keynote address at the LABI Annual Meeting in Baton Rouge yesterday, did her Fox News show in New Orleans last night and devoted some of the hour to the monument removal issue. That’s why Suber, the abject imbecile in charge of the cultural vandalist Take ‘Em Down NOLA movement, managed to worm his way onto national television. Ingraham could have treated Suber considerably worse. She could have asked him about his background as a Maoist communist, his history of racism and anti-Americanism or his do-nothing position on the SUNO faculty. Instead, she let him babble about how every item of public art in New Orleans featuring a white man should come down. He took that bait and swam as deep as he could with it, and then when sculptor Thomas Bruno, who was in the segment with him, attempted to discuss the monuments as great examples of public art people should have the right to interpret as it suited them Suber proceeded to interrupt him repeatedly. Perhaps his arguments, which are difficult to make coherent in the best of circumstances – Lord knows Mitch Landrieu sounds like a fool attempting to articulate them – might appear less as gobbledygook were Suber not to come off as though he’d been taking bong hits since early that morning. He appeared intoxicated during the segment. Not that Suber sober is a particularly compelling figure. Either way, now the country gets to see the man fronting the effort to destroy New Orleans’ cultural heritage. Not a good look for New Orleans at all.